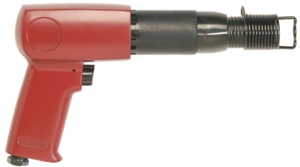 If your business relies on pneumatic tools in its day-to-day operations, you need a reliable distributor that you can trust will continually provide high-quality products and outstanding customer support. For companies in Kansas City, Wichita, Dallas, Fort Worth, and other nearby cities, the choice should be Wm. F. Hurst Co., LLC. We have served businesses throughout the Midwest since 1962, and during that time we’ve earned a stellar reputation for our ability to quickly and efficiently meet the demands of our customers. We offer an unmatched selection of pneumatic tools from industry-leading manufacturers, and we provide valued customer support from highly trained tooling experts who have immense knowledge of the products in our inventory. When partnering with Wm. F. Hurst, you can trust that we’ll help you identify cost-effective solutions that will enable you to maintain ideal efficiency levels within your operation. Contact the representatives at Wm. F. Hurst today to learn more about our assortment of durable and reliable pneumatic tools. We proudly serve businesses in cities throughout the Midwest, including Kansas City, Wichita, Dallas, Fort Worth, Joplin, Sedalia, and Springfield.